There is a long country named Chile. It ranges North-South more than East-West, over desert, plains, forests, mountains and ice. Many kinds of people fit within its limits, which is explained at the end. There is also an Islamist group from Somalia called Shabab al-Mujahideen. They do battle with their government to take control and govern according to a radical vision of Islam. They want to do this in Chile too, according to a news transcript of the channel Al-Jazeera on December 20th. Where in Chile would they begin? I don’t know, maybe Santiago. Maybe they think that they could start with the immigrant groups whose mother countries practice Islam, like Palestine, and try and mimick Che Guevara-like attempts at revolution in Bolivia. A recent photo album email was circulated by the Chilean Victor Abujatum (which came from Karen Garib Bravo) documenting dead and alive children in the war in Gaza. 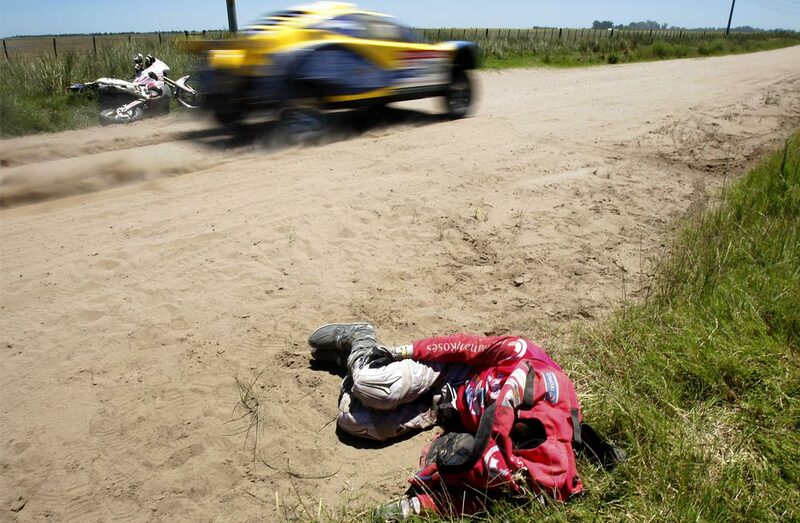 But that is nothing to really pay attention to when there is entertainment like the Dakar Rally to pay attention to, a thousands of miles race which from its traditional racing grounds in Northern Africa because of terrorist threats was shifted to the mountains and shrubs of Chile and Argentina. Unfortunately the race stayed in the north after coming from Buenos Aires, to Neuquen, to Mendoza, to Valparaiso, and then up to La Serena and Copiapo, before departing for Argentina for the trip back. Chaleco Lopez is your Chilean to follow in this matter. 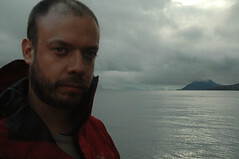 Alas, there are other, worthwhile, adventures to follow, like the self-supporting kayaking trip around a portion of Antarctica by Cristian Donoso, a friend, lawyer and explorer from Santiago, who has sprung is expedition career after a 2007 win of the Rolex Award for Excellence which gave him funding and prestige to launch his audacious tests of endurance and planning. This trip will be the longest unsupported sea kayaking expedition realized in Antarctica. During the first month, the expeditionaries will circumnavigate the Anvers and Brabant Islands, first seen in February 1820 by the United States citizen Nathaniel Palmer, on the voyage where he discovered Antarctica. During this first 300 nautical miles stage, we will do a meticulous survey of the North coast of the Anvers Island, barely explored due to its countless rocks, small islands and shallow waters exposed to the open sea, which makes it a dangerous place to incursion in larger vessels. 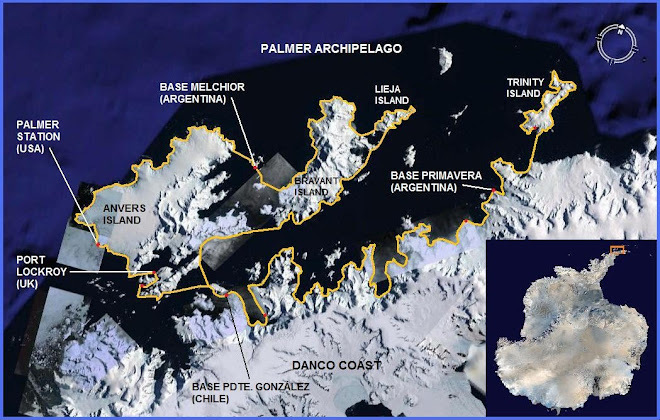 We will also explore the cliffy nooks of Brabant Island, and we will visit the bases, Lockroy, England; Palmer, U.S.A; and Islas Melchior, Argentina. On the second month we will explore the Danco coast fjords, as deep as the ice floes allow it, navigating nearly 200 nautical miles between the Chilean base, Gabriel Gonzalez and the Argentinean Primavera base. From that coast – which’s name remembers the unfortunate Lieutenant Danco, from the Gerlache expedition- We will cross to Trinidad Island circumnavigating and exploring its coast until we reach the Mikkelsen Bay, where we will be picked up at the end of February by the Antarctic Dream, to return to the American continent. During this first month he met up with Jon Bowermaster, a world-class kayaker and explorer who once lived in the south of Chile, the way south. Bowermaster is on his own Antarctic kayak expedition. You can find more out about the way south in this blog by a woman struggling to find her reasons to persist in the cold, wet and often desolate environs of Patagonia. “what the map of the world looks like early in the 21st century” and drawing attention to rarely reached corners of the earth for those who can’t get there. What is that greater picture, one might ask? I can only send you to Henry Miller, the banned author famous for his 1934 Paris-based novel Tropic of Cancer. From his perch drinking coffee or Pernoud on Montparnasse, guzzling wine “like rubies”, or as a cut-rate and sometime drunk copy-editor musing about Matisse and his sculptures that could be found up womens skirts, he railed against the illusions of societal grandeur and the distortions created by apparent modernity. He craved the animal way, raw and hungry. That might be a lesson for Chile, a country caught between the animal way and the modern way, the fruit stall or the hipermercado, schoolyard blowjobs or an attempted banning of contraception, anarchy or Opus Dei, bicycles or cars, the flowers of the valley or the conquest of the summits. What was it that Henry Miller called himself? “The Greatest Patagonian alive.” In a nod to the extinct indigenous groups covered in furs who buried their meat in the ground and for warmth kept never-ending fires on the Tierra del Fuego at the end of the earth, and the end of Chile. In The Air-Conditioned Nightmare (1945), written after a road-trip across America, Miller continues his assault on modernity: “This world which is in the making fills me with dread… It is a world suited for monomaniacs obsessed with the idea of progress – but a false progress, a progress which stinks. It is a world cluttered with useless objects which men and women, in order to be exploited and degraded, are taught to regard as useful. The dreamer whose dreams are non-utilitarian has no place in this world. Whatever does not lend itself to being bought and sold, whether in the realm of things, ideas, principles, dreams, or hopes, is debarred. In this world the poet is anathema, the thinker a fool, the artist an escapist, the man of vision a criminal.” Consciously in retreat from what he saw as a cancerous civilisation, Miller began to call himself ‘the Patagonian,’ that is to say, a primitive man to whom the taboos and fetishes of modern society seem ridiculous: “We need their paper boxes, their buttons, their synthetic furs, their rubber goods, their hosiery, their plastic this and that. We need the banker, his genius for taking our money and making himself rich. The insurance man, his policies, and his talk of security, of dividends – we need him too. Do we? I don’t see that we need any of these vultures. Oh, and how long and wide is this country? 2,700 miles (4,300 km) apart at its longest and 217 miles (349 km) at its widest and 9.6 miles (15.5 km) at its narrowest. A 27 year old Chilean mountain climber died alongside three others from New Zealand, France and Britain, during a storm at around 4500 meters on the famous French mountain of Mont-Blanc. Their decisions to ascend during the storm with inadequate equipment were cited by the regional police force as the principal reasons for their freezing death. While of course there were other nationalities involved in the tragic accident, I have been in situations with experienced Chilean mountain-climbers who have made poor, rushed decisions with poor or inadequate equipment for the conditions. See this photo set of the experience of Volcan Llullaillaco. It is a leap to generalize, yet my principal experience mountain-climbing with Chileans on Volcan Llullaillaco, in the North of Chile, in addition to observations based on the attitudes, preparation and gear and stories of others trying to climb el Cerro Juncal, in the Central Andes of Chile, leads me to conclude that a serious effort (if it is not already happening) should be made to properly educate the growing population of young Chileans taking an interest in the mountains. A list of resources about mountaineering can be found on my resources and links page. If not, more avoidable accidents will happen involving Chileans in Chile, or abroad. “PARIS – Four climbers died of cold and exhaustion after losing their way on snow-capped Mont Blanc in the French Alps, police said Tuesday. The bodies — women from New Zealand, France and Chile, and a man from Britain — were found at 13,120 feet, police said. “The group had no tent and failed to dig a hole to protect themselves from 120 km/h winds and falling snow,” said Olivier Kim of the regional police force. The link to the article in the Chilean mountaineering forum Tricuspide is here. SANTIAGO, julio 24.- Esta tarde se confirmó finalmente la identidad de la estudiante y andinista chilena que integraba un grupo de cuatro jóvenes que fallecieron en el Mont Blanc, en Francia, cuando intentaba alcanzar la cumbre en medio de un fuerte mal tiempo. Mariana Huerta Tellez, de 27 años, cursaba desde hace un año estudios de doctorado en la Universidad de Grenoble, en Francia, luego de egresar como licenciada en Física en la Universidad de Chile, adonde ingresó el año 1998. Ex alumna del Liceo Manuel de Salas, la malograda deportista residía con su familia en la comuna de Nuñoa, y su padre era también físico. De acuerdo a cercanos, se hizo conocida en el ambiente del deporte universitario por su buen carácter, sus conocimientos en la práctica del andinismo y su disposición a enseñar. Es por ello que la noticia de su muerte caló en ese círculo que fue el primero en recoger las informaciones a través de la página nacional tricúspide.com, sitio especializado desarrollado por montañistas chilenos. En el foro que acompañaba la nota, un usuario identificado como BLadiMir ratificó la vinculación de Mariana con la universidad, definiéndola como “una gran amiga”, y agregando que su deceso ya fue confirmado por su familia. “Gran amiga y compañera, su vida era estar colgada de una cuerda en un cerro… buscando hielos en todos lados. Enseñando, y siempre entregando un montón de su alegría”, señalaba, agregando que fue ella quien “inspiró a mí y a mi novia a seguir los pasos del montañismo”. ”La noticia llega con dolor a muchos amigos que ella tiene acá en chile… sus cumpleaños son siempre los más numerosos”, agregó. ”Una mujer sencilla con alma de niña. La vamos a echar mucho de menos”, finalizaba. En efecto, la información publicada por el mismo sitio señalaba que los padres de la joven ya iban en viaja a Francia para coordinar y acompañar el regreso de sus restos a Chile. En el mismo sitio, otro usuario identificado como Mauro Vásquez afirmaba haberla conocido en la Universidad de Chile, y recordaba su paso por la Facultad de Ciencias Físicas y Matemáticas, en Beauchef 850, destacando que “ponía pasión en todo lo que hacia, comprometiéndose a concho con lo que se proponía”. NO LLEVABAN IMPLEMENTOS ADECUADOS Mariana Huerta fue encontrada muerta cerca del mediodía en el macizo francés junto a otra estudiante francesa, un británico y un neocelandés, todos estudiantes de Grenoble. Según las autoridades locales, las causas de muerte serían hipotermia y agotamiento, tras una fatídica expedición organizada aparentemente sin saber de las malas condiciones del tiempo que se avecinaban. De hecho, Mariana había estado al menos en una ocasión anterior en el Mont Blanc, y tenía experiencia suficiente para enfrentar esa cumbre de 4.808 metros. Según lo informado, el grupo partió a las 3 de la mañana hora local desde el refugio de Durier, ignorando el pronóstico de violentas ráfagas de nieve y viento de 120 kilómetros por hora y temperaturas de 15 grados bajo cero. “Ellos se focalizaron en esta ascensión mítica ignorando los informes de Météo France, (y) deberían haber regresado. Esto fue simplemente terquedad e idiotez. Es su responsabilidad total”, precisó el capitán del pelotón de Gendarmería de Alta Montaña de Chamonix. Un guardia francés del refugio de Goûter los había avistado cerca del mediodía del lunes en la estrecha arista de Bionnassay, la más afectada por el mal tiempo, por lo que dio aviso a Gendarmería. De acuerdo a las mismas fuentes, hacia las 15 horas de ayer los propios jóvenes habían pedido auxilio, conscientes de lo delicado de su situación, pero no pudieron indicar su localización ni reaccionar adecuadamente al mal tiempo. El coronel Olivier Kim, comandante del grupo de montaña de Haute-Savoie afirmó que los malogrados andinistas no tenían carpa, llevaban vestimenta inadecuada y tampoco lograron cavar una trinchera para protegerse del viento. Las malas condiciones meteorológicas permitieron recuperar los cuerpos recién este martes a las 15:20 horas, a 4.130 metros de altura, gracias al trabajo de una patrulla terrestre de la Gendarmería francesa. Sin embargo, lograron bajar sólo uno de los cuerpos en helicóptero aprovechando una corta ventana de buen tiempo. El resto deberían ser transportados a primera hora del miércoles, cuando se espera otra ventana. Los rescatistas franceses señalaron además que una segunda cordada que participaba del ascenso, y que estaba compuesta por dos españoles y dos checos, logró protegerse construyendo un refugio pese a estar a mayor altura, cerca de 4.304 metros en el sector conocido como del Domo de Goûter. En ese lugar fueron rescatados los checos, mientras que los españoles, más equipados, prefirieron permanecer en la montaña. A reply to your comment on this post on climate change, class, environmental grandstanding and credibility. Sorry, you pulled out my class resentment/chip on the shoulder. “De muy mal gusto los comentarios. Somos una ONG preocupada dignamente por el tema medioambiental y el desarrollo Sustentable. Alternativamente, podría entender “mal gusto” como desubicado, o una persona que no sabe actuar en tal situación, o hablar en la forma o con la educación que requiere un contexto. En tal caso, pido disculpas por ofender sus sensibilidades, pero por sangre, es más probable que el mio es más cercano a la aristocracia chilena que la suya. Pero, no creo que hice algo de calumnia, salvo cuando comparé el sitio de web, y su lenguaje con Dianetics o Kurt Vonnegut. Puede ser que ud. reaccionó contra mis reseña historica de Fernando Léniz? Ecologicamente, el preside sobre la Corporación de Madera Chilena, el gremio de la industria maderero en Chile, que consiste basicamente en la industria celulosa. Digame ud. algunas razones para creer en alguien quien representa una industria que se ha privilegiado la tala de bosque nativo en Chile para poder plantar millones de hectareas de pino o eucalipto? 1. Rio Cruces, Celco, desestabilización de la Reserva Natural Carlos Andwandter, Muerte de Cisnes, Rieles y Cierre de Planta más nuevo y moderno del país. Campaña de relaciones publicas obstruccionistas. 2. Rio Mataquito, Celco, antigua planta clausurado, piscinas de desechos y rieles secretas y fuera de la normativa ambiental actual, muerte de peces en masa, contaminación del rio. Porque critico a Fernando Leniz? El, si es un socio, debe ser un hombre quien comparte tu vision de business development, social development and environmental sustainability. Si Léniz, quien preside sobre el gremio de empresas responsable por el producto de exportaciòn tercero o segundo más importante de Chile, la Celulosa (despues que el cobre y el salmon), tuviera una preocupaciòn verdadera por environmental sustainability, no habría la burda contaminación por la industria celulosa, por una parte (environmental sustainability).3. Por otra parte de tu lema mencionada, el desarrollo social, no habría causa tanto para el paro sindical por los patéticos trabajadores SUBCONTRATADOS quienes ganan por producción y con un sueldo fijo base, de algunos, de 60,000 pesos…. A caso tu viviría en estas condiciones? Critico a Léniz porque lo encuentro illegitimo y poco confiable. Critico a OikoscorpChile porque el es un socio, y ademas, cuando OikoscorpChile tuvo su momento para explicar quienes eran, con la entrevista a William Thayer, en El Mercurio Domingo, refirió al final de la entrevista, a que OikoscorpChile “esta trabajando con algunas iniciativas de conservación privadas”..o algo similar. Si quieren que la gente les encuentre legitimo, busca una relacionadora publica quien podría mejor tu sitio web, refinar tu discurso para que aparece más ecologico y encuentre algunos socios que son RECONOCIDOS POR SU TRABAJO en conservación al medioambiente… no a su simple explotación. Espero el proximo trabajo publico en el medioambiente de Oikoschilecorp en apoyo del medioambiente y biodiversidad, y por lo tanto un trabajo y participación en los temas del medioambiente en Chile.